My Beloved is always with me. I would not worship Him unless I saw Him. You know of the how, but I know of the how-less. The will of our beloved, should also be our own will. No separation exists between the Beloved and the lover. When he or she is as grateful for adversity as for bounty. May God deprive you of all that which deprives you from God. This is a disease no doctor can cure, only Union with the Friend can cure it. 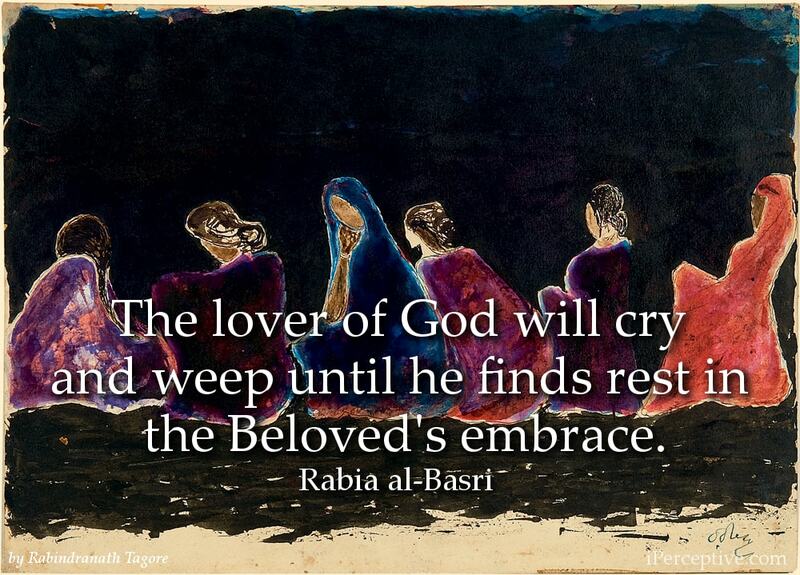 The lover of God will cry and weep until he finds rest in the Beloved's embrace. O Allah! Keep me engrossed in You and do not allow the people of the world to divert me. Death is a bridge between friends. The time now nears that I cross that bridge, and friend meets Friend. My love for God has so possessed me that no place remains for loving or hating any save Him. The best thing for a servant who desires to be near his Lord, is to possess nothing in this world or the next save Him. Seclusion is the soul's ideal preparation for reaching God. It is in the state of solitude that the soul contemplates on the attributes of God. Oh Lord: The Stars are shining and the eyes of man are closed and kings have shut their doors and every lover is alone with his beloved and here am I alone with Thee. If I adore you out of fear of Hell, burn me! If I adore you out of desire for paradise, lock me out of paradise. But if I adore you for yourself alone. Don't deny to me your eternal beauty. O Allah! I am forlorn, without mother and father. Now my hand too is broken. But I do not mind these things if Thou be pleased with me. But make it manifest to me that you are pleased with me. Rabia was once asked, "How did you attain that which you have attained?" 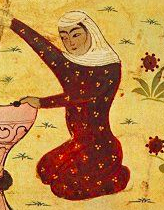 One day, Rabia was seen running, carrying fire in one hand and water in the other. They asked her the meaning of her action and where she was going. She replied, I am going to light a fire in Paradise and pour water on Hell, so that both veils (hindrances to the true vision of God) completely disappear." O children of Adam! Your eyes provide no passage to perceive the Truth, nor is there any access to Him by speech of the tongue. The faculty of hearing is but a highway to distress for the speaker, while your hands and feet only steer you only into bewilderment. The true work is in the heart. Try to acquire an awakened heart, for when the heart is awakened, it will have no need of a friend. That is to say, an awakened heart is one which is lost in God. 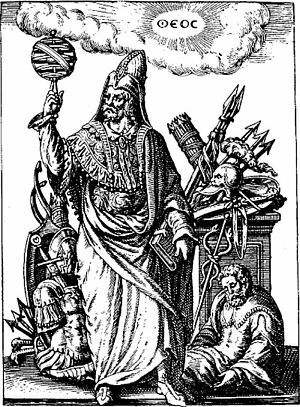 What need does one who is effaced and lost in God have of a friend; for this is the station of Annihilation in God. This is the substance of my complain. Revealing that which o'er my spirit went and came. 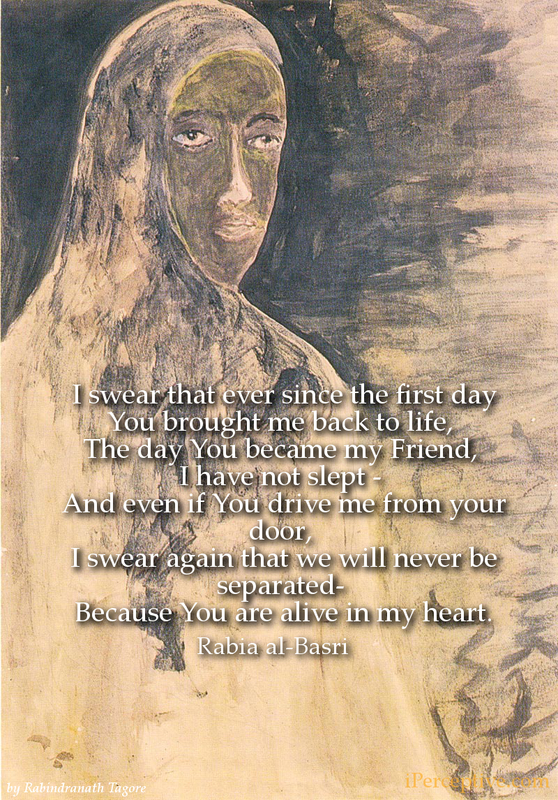 Rabia al-Basri was a Sufi mystic saint, who's widely recognized as being the most influential and notable female Sufi mystic in Islamic history. She did not leave any written work of her own, as most of the sources of the quotes and stories attributed to her are unknown..